Visual Fragmentations in the Eastern Bloc…The sun peaks above the Rhodope Mountains as its heavenly beams hit the sky-high gray blocks, dispersed throughout the ‘new’ Bulgarian capitol of Sofia. These rigid concrete structures have been left to remind us of the Old regime: a time of unyielding political ideologies, a time of great social pride and a symbol of an era that we will never forget, even if we close our eyes. Ein Augenblick and we wake up in front of the same old, gray socialist scenery: a landscape, for which an artist would only need his duotone palette to paint. Baudrillard would tell us to stop dreaming…and here we are: awake, sticking our heads through the concrete balconies, peeking at out neighbors who are hanging their gray underwear on the front line, so that everybody in the block can see. Here we walk through the national parks, embellished with the monumental sculptures from the seventies; but there are no roses to adorn the gardens…and we thought that the Rose was the symbol of our country! We continue walking through the streets of stone and when we look up, we see the gray clouds almost touching the last floor of the concrete monumental blocks. But this is not a critique on the iron regime or the social values; it is a gaze at the Visual Fragmentation in the Eastern bloc. It is a gaze at the time of political and social change, which nevertheless resonates against the historical fixation and breaks through its old shell. With the start of the new century, the old shell gives birth to the bird that will aim its wings toward new horizons: where it will meet new ideologies and expectations. In a mystical path toward renewal, Bulgaria meets its new leader – the European Union. As the old generation pulls the robe toward the past, the new furiously digs its nails in the future. This very struggle of old versus the new creates a crack, like one after an earthquake. This gap will give birth to a Fragmentation not only between the old and new mentalities but also to the social structures present in our visual field. And, how was the artistic form exploited as a form of freedom, will be discussed shortly. Looking back at how the Soviet Union influenced the Bulgarian culture (arts and architecture), we go way back to the Stalinist era. Take a walk in the center of Sofia and you will see the sandpapered yellow-brown buildings moderately embellished with Slavic motifs. Thus, Bulgaria followed the national form, which associated with the earlier Russian tsars’ architectural tradition. A classic example is the tomb on the national communist hero, Georgi Dimitrov[i], who’s sandpapered classic mausoleum (built in just six days) resembled Lenin’s tomb. Another is the enormous store TSUM [ii] that was a replica of the Russian GUM. Furthermore, this public display is a pure example of the Social Realism, whose style infiltrated the visual and literary arts as well. Thus, the ‘national form’ was the only form accepted as ‘Realism’. In other words: this was the architecture of the cult. However, under Khrushchev, the old façade found a new image. The new leader attacked the heavy industrial materials and reinforced the concrete architecture. From then on, the tall, gray blocks occupied the capital and dispersed their practicality throughout the whole Eastern Bloc. They took form of hotels, on the Black Sea and resorts, in the mountains. By saying that the Technology is independent of ideology, Khrushchev added a new sense of freedom in the visual plan. In his goal to reflect upon the western techniques, Khrushchev’s concrete ideologies didn’t quite meet Walter Benjamin’s description of the Arcades in Paris. Instead of illuminations and glass buildings, the concrete walls of the blocks aimed at housing the growing population, and at the same time, left recreational areas between them. The architects’ task was a revolutionary one: they introduced the communal domkomuna and built vertically in order to create recreational space within the public lands. Nevertheless rigid and gray, these structures represented the development in technology and created a new visual spectrum… and maybe, a materialistic representation of the social mentality. A paradoxical representation of harmony and internal isolation, warmth and coldness… and later, a symbol of the old regime versus the new. Being under the pressure of the Ottomans for five hundred years and later following the ideals of the Soviet Union, Bulgarian mentality developed as a rigid concrete shell that didn’t seek independence, because it just couldn’t imagine it. Thus, the shock of democracy shook not only the political grounds, but most of all – the society. This new wave gave rise to fragmentation between the old and new generation. The social distrust and insecurity of the elders refused change as it further isolated itself within the concrete walls; while the younger population radically tried to break away from its history and promote integration beyond the communist blocks. It is this very fragmentation within society that is materialistically portrayed in the face of architecture and art. It is the answer behind the abstract scenery where: concrete blocks resemble Easter eggs in their orange-gray-yellow-gray patterning; glassy tall departmental stores in the middle of red-roofed houses, or covering up of national monuments by colorful graffiti. The answer comes in two tactics: covering up and destroying the past. The artistic form during Communism followed the path of political ideology: to portray the positive social values and represent ‘The Cult’ and its ‘Realism’. Thus, the rise of monumental sculpture during the seventies portrayed national heroes and the struggles in the battle against the Ottomans. This visual representation is and was the only ‘Reality’ for the generations. It promoted the heroism of the nation and assurance in its well being. Its homogeneity was never questioned, and so it rested its power within the hands of the ideology. Between the concrete blocks and bronze sculptures, we can infer that the visual spectrum was simply harmonious. Furthermore, the visual arts were also submerged in the ideology of the state and always portrayed the ‘Reality’ that the people desired. 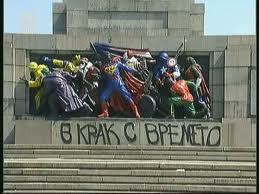 The art and sculpture by Ilia Petrov, for example, portrayed this very socialistic realism, which political events required to be a conceptual and recognizable representation. By being a mirror to society, the visual arts had to reflect the images in order to encourage and reassure its viewers. In a sense, art always struggled between its autonomousy and the interaction with society. Furthermore, to answer the question whether there was an avant-guard movement in the visual arts, we need to consider the role of art and its publicity. It is too bias to state that artists only used art as propaganda, but it is certain that those individuals who diverged from the common path were not presented to the public eye. Social realism was at the bottom of the educational and idealistic system. However, the avant-guardists (such as Genko Genkov) were not represented at this time; the only modern art able to enter the state was in the form of Posters from Poland. At the same time, very well accepted were the peasant icons of Stoian Venev (1904), which showed that communism was not able to weaken the religious devotion within the society, as it had done in the USSR. Furthermore, the ones who found the means of expression through a more radical, to say avant-guard, way were simply not chosen to be exhibited in the national and state galleries/museums. Museums were to present the social wealth and values and of course, ideologies. In other words, the visual arts always sought to be autonomous: economically and politically. During Soviet’s reign on the Eastern Bloc, art was chiefly a means of level of political freedom. Furthermore, the more art deviated and isolated itself from the political sphere and common ideology, the more it became a symbol of social freedom and democracy. If art could break through these concrete walls and show its own ideas autonomously; if art could isolate itself in order to integrate with liberty, then this would be the real start of a new century. When society expresses this artistic separation and visual fragmentation, then it is ready for real integration. In other words, this is when society can break away from the old shell and fly towards the new means of liberty. In new means of liberty, I don’t mean a utopia, but a period in time when the visual and social fragmentation will portray the rise of a culture. Its portrayal might be the loss of its original aura, as Benjamin would claim: for example, the stage performance of otherwise village folklore dances. Or it may be portrayed as annihilation of the past ideologies, for example, the blasting of Georgi Dimitrov’s mausoleum. In other sense, it might come as the freedom to cover up the past, block our vision: as in Christo’s environmental art projects – for example, the Wrapping of Reichstag[iii] , as wrapping of communism. Furthermore, this visual fragmentation can be observed within the old communist blocks: their inability to be demolished led to the only option – to be individually fixed and covered up in rather Florentine colors. When someone tells you that you live in an Easter egg, it is because: few of your neighbors decided to patch up their balconies with yellow and red siding, while the rest of the building is left in its old gray clothes. Walking through the National Park of Liberty[iv], you see monuments adapted for skater wrings and heads of sculptures missing. However, a few blocks down, in the middle of the old corn-field, you see the New Jerusalem of modern architecture. If Walter Benjamin was alive, he might have written a second edition to the Arcades. If one was to record the date of the new Arcades project, it probably would be the beginning of the twenty first century in Bulgaria. Before, it was the ideology of the Soviet Union and now, it is the new expectations from the European Union. The new system is trying to cover up the old, but it is the manner of their incompleteness and their coexistence that makes this field of visual abstractions. The wheat fields of Mladost, Sofia have given birth to new tall, glass constructions resembling the Parisian arcades. It is if the new office buildings have compensated the newer blocks with their French windows, since the domkomuna are now constructed as a miniature version of the old Stalinist national form. This outcast region in Sofia demonstrates the birth of a new form of life by presenting a new colorful façade amongst the grayness; it is like a physical metaphor of the New in relation to the Old Nessebar[v]. Furthermore, the image of Mladost has become symbolic of the coming of a new era. Mladost, meaning Youth, is the creation of a New Jerusalem in technology and arts. We can further separate the capitol city in three parts: the national form – representation of the center, Khrushchev’s domkomunas located around the center, and finally, the New Era region of Mladost[vi]. However, we cannot fully isolate the areas by themselves, since the beginning of every new period in Bulgarian history has added on to the previous. It is interestingly to note that there is hardly any destruction (other than the ex. of Georgi Dimitrov’s mausoleum) but there is rather covering up and building on top of older forms. Thus, the visual existence of older structures is important for the Bulgarians in order to help them preserve the historical pride and remembrance. It is a place where one cannot simply forget the past because he is continually surrounded by it. The new façade thus belongs to the new generation, and accordingly, the older generation hides away in the grayness of the vertical monuments. A time of transition and coexistence of two dominant systems has created not just the visual but the social fragmentation. Used to a harmonious lifestyle, the old generation of our grandfathers enters the agitated waters of a new era, that some like to call democracy. A new Era has come! One of illuminations and attractions, a time of visual abstractions and distractions, a purgatory between hell and heaven. And we continue gazing in the future unable to forget the past, as it has stubbornly dug its claws in the blanket that now wants to cover it. A time of visual freedom: where the gray can exist among the spectrum of colorful horizons. ← National Curriculum behold, here come the Grand Curriculum Designers!